It is just cool to eat some burger. And I must add that it is often worth it. Burgers are not connected with McDonalds anymore. And what about one small Prague bistro, called Dish? 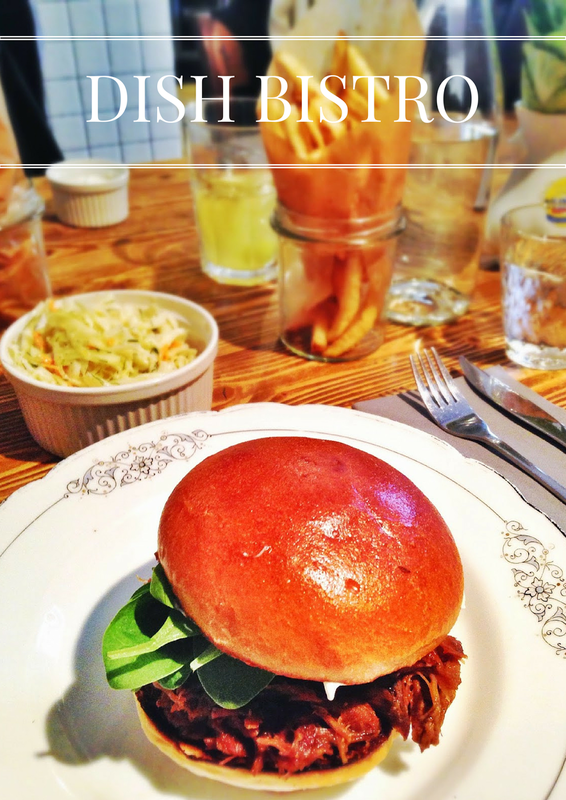 Dish bistro is regularly placed in the list of TOP burgers in Prague. The location at Vinohrady just supports this position. You can find Dish in Rimska street, just a few steps from Namesti Miru. The space is quite small so make sure to have a reservation. Me and my friend were seated at the entrance anyway. At least we could see the kitchen and how they prepare those unfamous burgers. The interior is cozy, mainly because of wood. We went for Savory burger where you can find beef with dish ketchup, portobello mushroom, caramelised onion, baked tomato and parmesan cheese chips. What can I say, great combo. Parmesan is always a good idea and together with tomato and onion was just perfect. The beef was of course fresh, juicy and just great for burgers. The second burger was Lamb where we had slow roasted lamb with confited garlic aioli and spinach salad. The spinach was fresh, no frozen disaster. The meet was falling apart and I was in a heaven. We wanted fries. They were crispy and I could eat the entire bowl. And coleslaw salad! You immediately start to feel more healthy after burger. I love coleslaw. When I was 14, I used to eat it at KFC. Now, it is kind of different level. It was served with mustard dressing and cilantro. I really like cilantro and the combination was delicious. Dish met my expectations. They have awesome burgers, not too small and not too big. The Tavern has bigger burgers for example. The service is friendly and I was overally satisfied. I will come back some day for sure, I want to try burger Koza Nostra!